Azia is a 5 star three-in-one boutique Cyprus Hotel with its own character, and a foray into sophisticated escapism that offers stylish barefoot living, understated luxury and casual unobtrusive service. The Hotel is situated in a quiet location, 30 minutes away from Paphos international airport and 15 minutes from the town centre, the shops and nightlife. One of the few resorts or Cyprus hotels with a west-facing outlook, the Azia hotel provides guests with a sublime view of blazing indescribable sunsets. The Hotel has 183 room/suites. All rooms feature wireless internet, ensuite bathroom, mini bar, satellite television, central music system, hairdryer, telephones in bedroom & bathroom, air-conditioning, central heating, safe deposit box and smoke detectors. 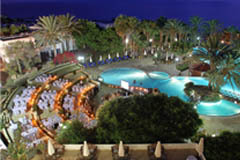 •	Amphitheatre: For dining alfresco by candlelight and surrounded by impressive tropical gardens. 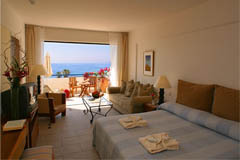 •	Akamas Restaurant: Serves a rich selection of a la carte dishes and theme buffets on the garden terrace. •	Katoi Coffee Shop: Offers Buffet breakfast, A' la Carte lunch menu and special theme evenings. 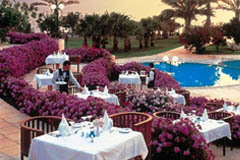 •	Cubes Garden Restaurant: Offers the finest international cuisine in a beautiful conservatory. •	Cava Bar: Open throughout the day and evening, offering morning pastries, drinks and light snacks. •	Yialos Pool Bar: Offers cocktails and light snacks. 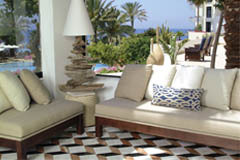 •	Cipro: Serves a fusion of Mediterranean cuisines, a 'la carte and buffets, in the exquisite marble conservatory. The Azia Resort has 14 conference rooms with flexible seating arrangements to accommodate from 10 delegates up to 660 delegates classroom style. The meeting rooms can be used separately or be combined. 32 syndicate rooms are also available. The Hotel offers a Spa centre, sauna, steam bath, 1 outdoor fresh water swimming pool, 1 indoor swimming pool, a tennis court, Gym and water sports facilities.